Last night, we decided to embark on another kitchen adventure. I’ve been scouring the world wide web for new ideas and recipes, and last week I stumbled upon the Everyday Paleo blog post for homemade plantain chips with guacamole. I was surprised to find the recipe, because for some reason, M and I were under the impression that we had invented the combination of plantain chips and guacamole…we pretty much thought we were culinary geniuses…but apparently, everyone eats plantain chips with guacamole…who knew? If frying, place coconut oil in a pan over medium heat. Slice the plantains either width-wise or lengthwise with the peel still on (a tip from Everyday Paleo: the plantains keep their structure better with the peel). Remove peel and place in oil, and fry until brown on both sides. If baking, line a baking pan with aluminum foil and spray with olive oil. Place the chips on the tray making sure that they do not overlap. Spray the chips with oil and salt them at your own discretion. Bake for about 25 minutes rotating the tray once. 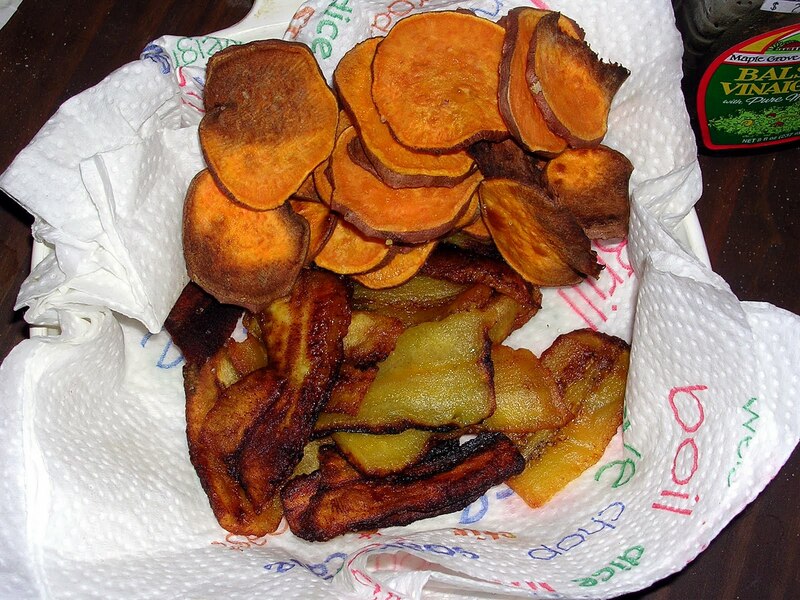 (Follow the same protocol for sweet baked sweet potato chips, but bake for about 30 minutes). The baked chips came out great! Some were crispy and some were chewy. All of them were deliciously sweet and salty! 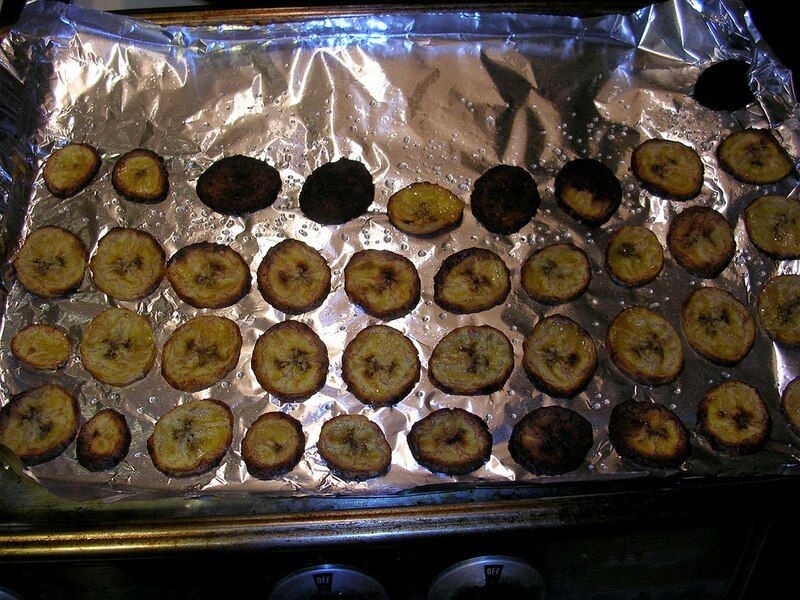 The fried plantain chips were, in M’s words “sinful.” The first thing he said when he tried one was “these can’t be good for you…” I mean, they’re not great for you…but they’re better than…some other things. Frying the plantains in coconut oil seemed to caramelize them more than baking them. The browned edges of the chips were almost like candy, but the added salt balanced the sweetness perfectly. They were a little bit thicker and chewier than their baked brothers, but we ended up liking these more. M ground up the hamburger patties in a bowl, added the spices and then cooked the meat in a pan with some olive oil and a little water to moisten it up. In the future, we’ll probably just buy ground beef instead of using already formed hamburgers…but we were trying to be thrifty. 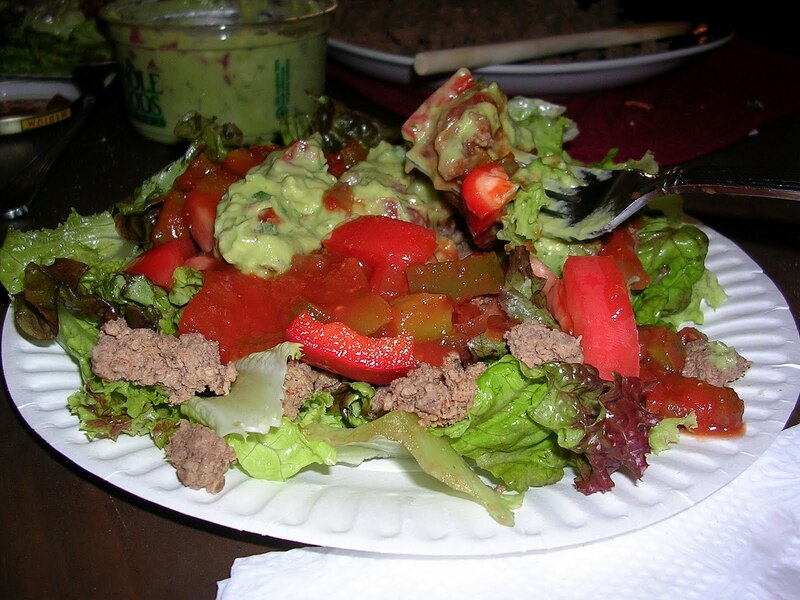 I cut up some tomatoes, red pepper and red leaf lettuce for the salad base. 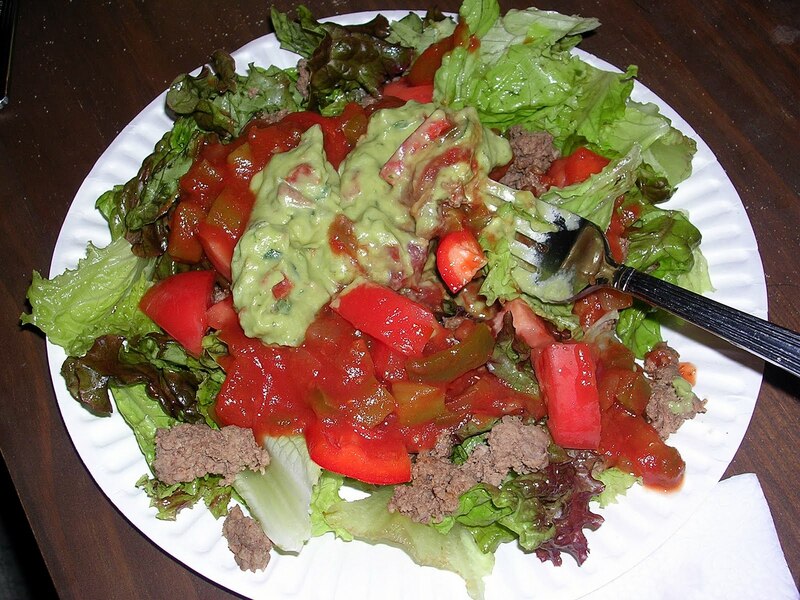 We topped our salads with salsa and some guacamole from Whole Foods. It was a great, homemade Mexican-ish feast with plenty of leftovers for another day. We both ate too much and walked off our bellies with Chester after dinner. Isn’t it great to eat too much of a meal that you made yourself? To want to eat more of something you created? It’s kind of a new experience for me…and I love it! No problem, Shannon! They were super easy to make…and SO worth it!